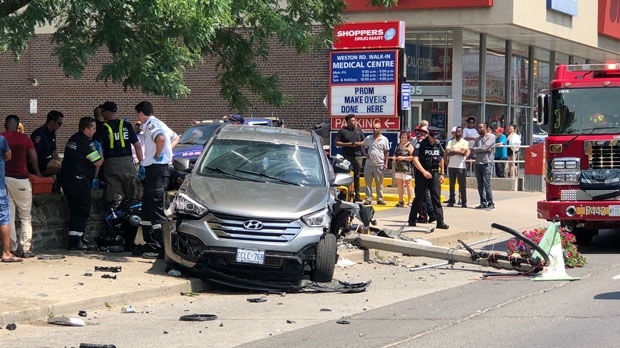 Two people were taken to the hospital after a collision in Toronto’s Weston neighbourhood Thursday afternoon. Paramedics say the collision occurred around 1:45 p.m. at Weston Road and King Street near Lawrence Avenue. According to police, a pickup truck hit a curb, a light post, and two pedestrians. A woman in her 30s, who was in a medical schooter, was transported to a trauma centre with serious injuries. The second pedestrian, a man in his 40s, was transported to a local hospital with minor injuries. Ken Theobald witnessed the crash and told CTV News Toronto that he saw a woman thrown into the grass by the force of the impact. "She was yelling in pain," he said. "She said she had pain in her leg." The driver remained on scene.